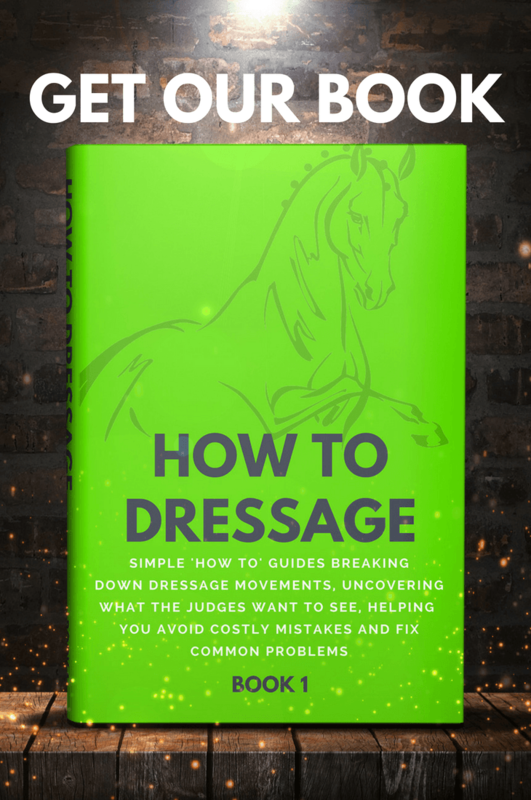 Take a look at your dressage score sheet, and you will notice the word, “elasticity” mentioned in the collective marks and the directives for some of the movements. Elasticity is closely related to suppleness, one of the Scales of Training. When the horse is supple and elastic, he is a pleasure to ride and to watch. You’ll also get more elevation and ground cover from the trot and canter. And that means more marks on your score sheet! So, how do you develop your horse’s elasticity? Before you can make your horse’s paces more elastic, you must make him supple through his body. Suppleness comes from a good connection through the horse’s back to the contact. You must be able to sit to your horse’s natural rhythm without moving your legs or hands. If your hands are not independent, they will move, disturbing the mouth and interrupting the rhythm. A connection can is only possible by establishing an elastic contact with the horse’s mouth, and to do this; you must put your horse in flexion, which enables you to control the inside and outside of the horse. Ride from your inside leg into your outside rein and bend your horse. When you can do this consistently on both reins, your horse will develop better straightness and will be able to work through a loose, swinging back to the bit. 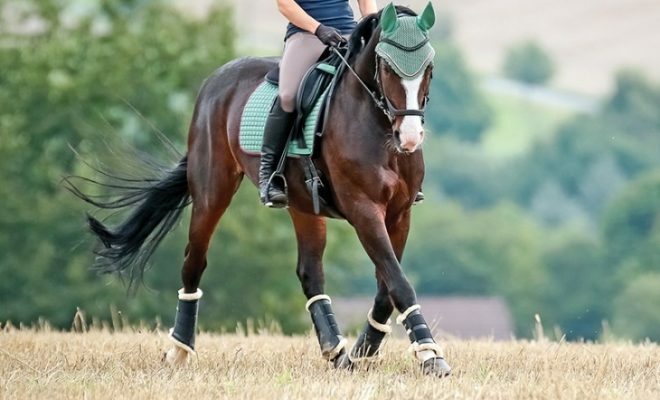 Once you can flex and bend your horse to an independent hand and supple seat, you can use transitions to develop and improve the elasticity of the gaits. 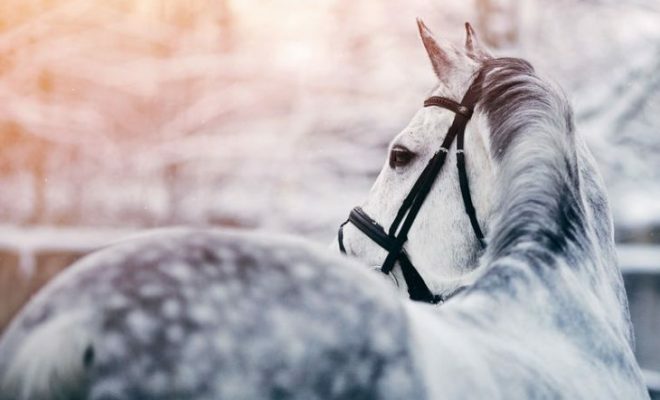 Use transitions such as trot-walk-trot and canter-trot-canter to help motivate your horse, creating more energy and swing through his back and thus greater elasticity. 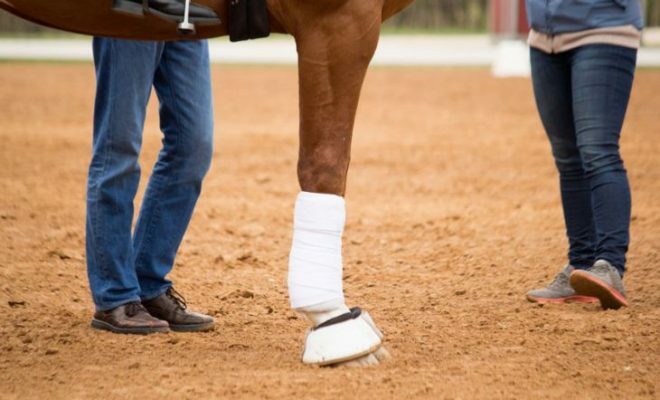 Lateral work is excellent for teaching your horse correct flexion and bending, which will consolidate the genuine connection you’ve been working to achieve. In shoulder-in, your inside leg pushes the horse into your outside rein and helps to keep the connection from behind to the horse’s mouth. Through the shoulder-in exercise, you will develop a freer shoulder, which you will need if you want to ride a good half-pass. 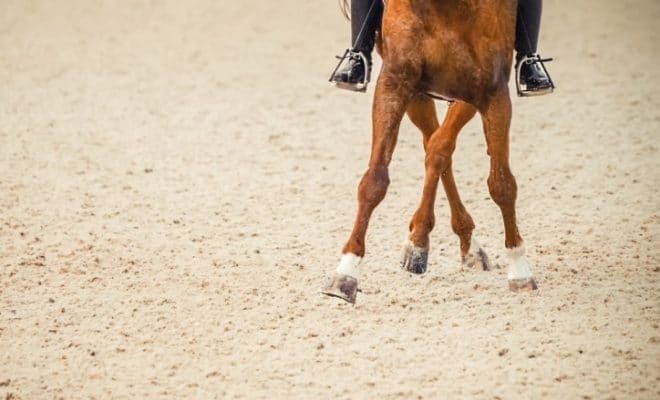 All the lateral work helps to bring your horse’s hind legs underneath him, lifting the forehand and making the shoulders lighter and more mobile. Once you have achieved this, you can ask for more impulsion, which in turn will help to develop more elasticity. When the horse is working with elasticity, he will demonstrate fluent, sweeping, ground cover and a clear crossing over of his legs in half-pass, which is sure to gain high marks! When riding your horse to increase the elasticity of the paces, you must always work in rising trot, especially on young horses. Sitting to the trot can cause the horse to tighten through his back, which will kill any beginnings of suppleness or elasticity you have started to develop. A useful exercise to ride during your training sessions is to allow the horse to take the rein and stretch over his topline. As the horse stretches for the bit, his back should lift and become rounder. The more impulsion you create, the more elevated the horse’s strides will become. As a result, the elasticity of the trot will continue to improve. You can also ride this exercise in the canter. But in the canter, it’s likely that the horse will tend to work more downhill and onto the forehand, especially if he is a novice. 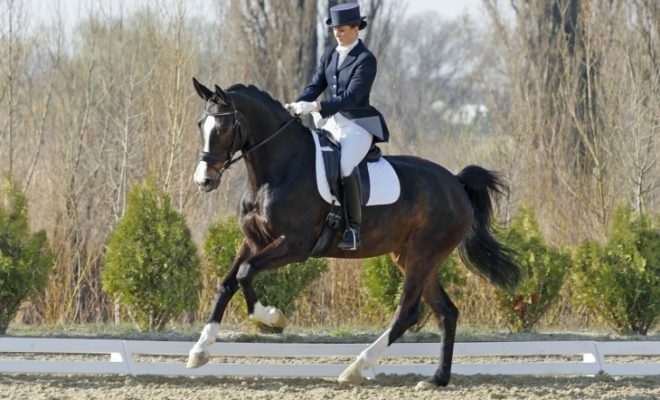 Use your seat and leg to apply half-halts, which will help to develop more engagement and push the horse’s hind legs underneath him, lifting the forehand. Another useful exercise for improving the horse’s suppleness and engagement is riding spirals in and out of a 20-meter circle. Place a cone or marker at the center point of your circle. Ride a 20-meter circle, taking care that you keep the cone as the center point. Gradually spiral inward towards the center of the circle, decreasing its size as you go. Be sure to keep the rhythm and impulsion as you ride the spiral in, riding from your inside leg to your outside hand. When you reach the smallest diameter circle that your horse can confidently cope with, spiral back out again. The spiral exercise is a brilliant way of teaching the horse to adjust his balance and bend to handle the demands of a smaller circle. Spiraling also helps to develop impulsion and suppleness through the back, leading to increased elasticity in the steps. Again, you can ride this exercise in trot and canter. Even if your horse has naturally good paces, you can improve them by developing more elasticity. 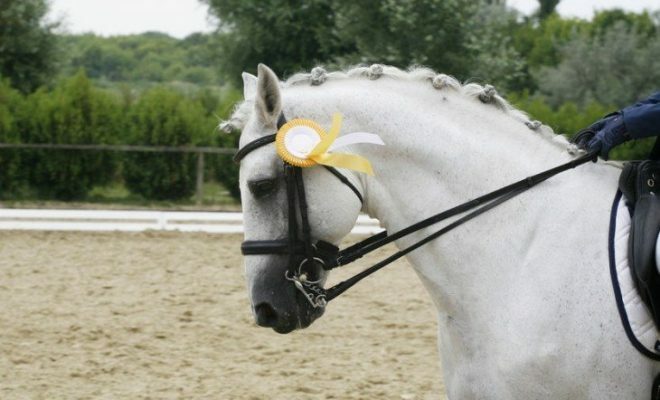 Elasticity comes from the suppleness through the horse’s body, which you can achieve by developing bend, flexion, impulsion, and a genuine connection through the back of the horse to an elastic contact. As you can see, everything about the correct way of going and developing elasticity is linked directly to the Scales of Training. Pay close attention to developing each scale and your horse’s paces will naturally become more elastic and expressive. So, did you manage to create more elasticity in your horse’s paces by following our tips? Tell us how you did in the comments section below!